In the following we aim to find out who and where the primary actors are in the scientific debate on the Arctic. We have used the digital tool, Issue Crawler, in order to locate the scientific research network on the Arctic. The map bellow shows the co-link behavior of a network of scientific research institutions on the Arctic. The Issue Crawler has crawled a list of research institutes, which we have elected and entered in the software, and the resulting map shows a network of websites, which have been linked to from at least two of the starting points. The colours of the hosts (actors) refer to the type of website (e.g. .gov) as is shown in to the right. The size of the actors illustrate the number of in-links the current actor has received from the network. The placement of the actors is due to the centrality in the in-link behavior. The central actors on the map are the actors who have received the highest number of in-links from other central actors. The Issue Network was found by making a Google search, with the key words "arctic scientific institution". 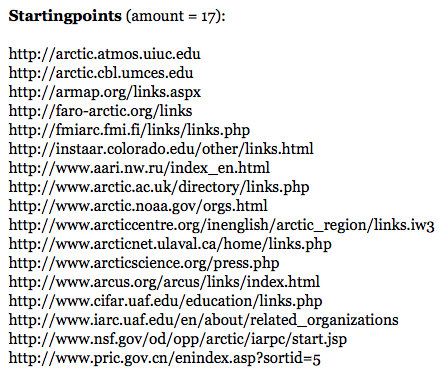 Going through the 100 hits, which Google came up with, we picked out all research institutes, who deals with the Arctic and who has out-links to other Arctic related websites. It left us with a list of 17 URL, which constitute the starting points of the Issue Crawl. >> Google found the websites with the highest 'weight' on the Internet among scientific research institutes on the Arctic, without discriminating in regard to geographical location of the institutions. In other words, by trusting Google we favoured the most "weighy" websites as well as active and relevant (Arctic related) linking behaviour. What has thereby been encapsulated is a particular issue: the scientifically constructed Arctic. The source cloud to the right shows the hosts from the Issue Network above, sorted by Internet sources. The source cloud gives an overview of the source type of institutions that are dominating the Arctic scientific issue on the Internet. The size of sources is due to the frequency by which they occur as hosts in the issue network from Issue Crawler. As the issue network illustrates, the 17 starting points have a co-link network of 45 hosts. In order to categorize these hosts, we have sorted them by their source type, resulting in this illustration showing the weight of the different source types. Of the 45 hosts, 7 have been excluded due to irrelevance (Twitter and Facebook) or double entry to an already mentioned site. >> Due to the very established character of the actors, the in-links they receive are very likely to be aspirational or cordial in character - being an expression of a desired affiliation. The bar charts bellow respectively show the amount of in-links (links from network) and out-links (links to network) in the Issue Network and relates it to the five types of websites. The two bars both indicate the in-link and out-link behaviour of the Issue Network hosts. The green bar shows the amount of links of an from a given type of website in total, whereas the red bar shows the number of links but this time relatively in regard to the appearance of the given website type in the Issue Network. Whereas "the U.S. Governmental bodies" receive most of the links for the network in total (10,224), it is the "UN bodies & International Arctic Committees" who receives most of the in-links in relative terms (1,804) - that is when we take into consideration the frequency by which the given type of website appears in the network. It is thus very popular for scientific institutions investigating the Arctic to link to the latter type of websites. In relative terms, environmental research units receive the smallest amounts of in-links (449). When it comes out-linking behavior, the bar chart shows that the "U.S environmental research units" are the most eager out-linkers both in total and relative terms (112; 12). "U.S Governmental bodies" and "Other environmental research units" are the least out-linking types of websites in relative terms within the Issue Network.